Feline Pet Foods – Healthy or Deadly? Healthy Choice or Deadly Mistake? Every year the pet food industry makes millions of dollars selling their products that claim they are a “Complete and Balanced Diet,” but commercial pet foods are unfit for animal consumption. The American Veterinary Medical Association confirms that pets on a routine basis are rendered after they die in shelters or are disposed of by animal control and health officials, frequently find their way into pet foods. Each year in the United States, 286 rendering plants dispose of 12.5 million tons of road kill, dead feline and dogs, animal fat, and meat wastes. Large vats that are used to grind and filter animal tissue prior to deep frying, holds a mixture of body parts ranging from dead and euthanized dogs and cats with their flea collars still attached, deer, raccoons, and snakes to plastic wrap the animals were sent in. The mixture is then fed in a machine called an expander and steam or water is added. The mixture is subjected to steam, pressure, and heat until temperatures reach 305ºF. After that the mixture is put through dies that determine the final size of the food. Then it is cooked at high temperatures and high pressure. Finally the Food is allowed to dry for 30-45 minutes. The final product contains pharmaceuticals that lead from antibiotics from livestock, euthanize (a drug that stops the heart), and heavy metals that accumulate from a variety of sources: pet I.D. tags, surgical pins, needles and collars. Unsold meats, chicken, and fish that arrive in plastic wrap and Styrofoam even end up in the mixture. Transmittable spongiform encephalopathy (TSE) more commonly known as “Mad Cow Disease” can be found in commercial pet foods. The risk of exposure to TSE is three times more likely than eating hamburgers. BHA and BHT, known to cause feline liver and kidney dysfunction can be found in dry dog foods. Propylene glycol is found in many semi-moist pet foods, is a first cousin to anti-freeze, and destroys red blood cells. Lead also frequently shows up in pet foods, even the ones made from livestock. A diet of commercial pet foods contributes to feline and dog cancer, skin problems, allergies, hypertension, kidney and liver failure, heart disease and dental problems. If your feline or dog suffers from any of this, take them of the commercial food for a few weeks and try a natural raw holistic diet. 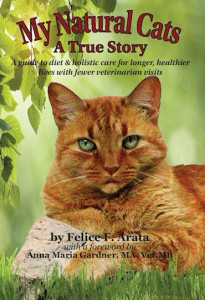 Help your feline become healthier by changing to a homemade raw meat cat food diet, supplemented with “My Natural Cat”.